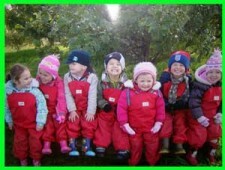 Pendle Nursery run forest school sessions every Wednesday throughout the year. Led by a qualified level three forest school leader . By participating in engaging, motivating and achievable tasks and activities in a woodland environment each participant has an opportunity to develop intrinsic motivation, sound emotional and social skills. These, through self awareness can be developed to reach personal potential. Forest Schools has demonstrated success with children of all ages who visit the same local woodlands on a regular basis and through play, who have the opportunity to learn about the natural environment, how to handle risks and most importantly to use their own initiative to solve problems and co-operate with others. Forest School programmes run throughout the year, for about 36 weeks, going to the woods in all weathers (except for high winds). Children use full sized tools, play, learn boundaries of behaviour; both physical and social, establish and grow in confidence, self-esteem and become self motivated.